The Villages, Florida United States - New Listing! Home with Gas Golf cart! | RE/MAX PREMIER REALTY Inc.
New Listing! Home with Gas Golf cart! 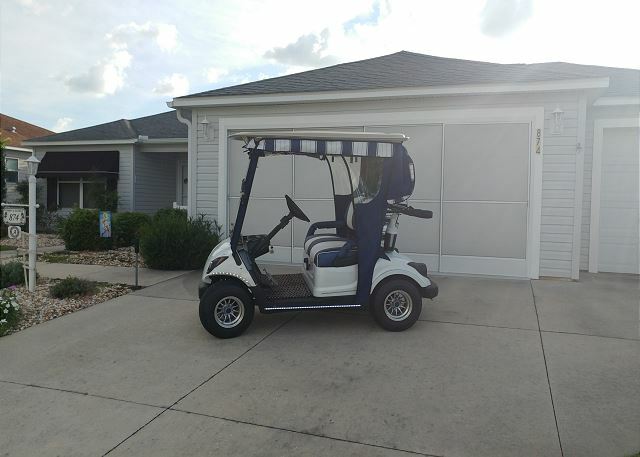 JUST LISTED ANOTHER BEAUTY WITH A GOLF CART AND GOLF CART GARAGE. Two bedroom ranch home with den/office in a great location. This is a nice home with a king bed in master, queen in the guest and a twin in the office/den. This home has laminate floors. Nice kitchen gas stove and plenty of eating and cooking space. Dining seats 6. Golf cart included for your enjoyment. With your Villages ID you have free access to 33 executive golf courses and discounted 12 championship golf courses. Golf in The Villages is tailored to all levels of play. Whether you a beginner or have a low handicap you will still find them challenging. You may also enjoy any of the recreation centers and Olympic sized heated swimming pools. Recreation centers offer a wide range of outdoor activities such as bocce ball, shuffleboard, tennis, pickle ball, horseshoe pits and basketball to name a few. In addition there are more than 500 indoor/outdoor hobbies/events offered throughout The Villlages. Explore any one of the three town squares which offer dining, shopping, live music and dancing almost every night of the year. Come and live this awesome lifestyle we have here! ***Village ID's are not required for renters to occupy a home, however, if you would like to enjoy any of the amenities that all renters and owners are entitled to, you will need to have a Villages Identification Card. Your Villages ID will cost $50 (which will entitle you to 2 ID's). Robert B. from The villages, FL United States recommends this vacation rental.